I've been having a bit of a crisis lately about hating a book I'm supposed to love--Wolf Hall, by Hilary Mantel. I don't always mind being in the minority. In fact, it can be quite satisfying. I'm one of the few (it seems) who know and love the Icelandic author Halldor Laxness. No problem--we Laxness-lovers are obviously the cognoscenti. Conversely, I could accept that I'm the only one who hates a book that everyone loves. The problem in the present case is that there are both many Wolf Hall-haters and many Wolf Hall-lovers, and (dreadfully enough) all the smart people seem to be on the loving side. 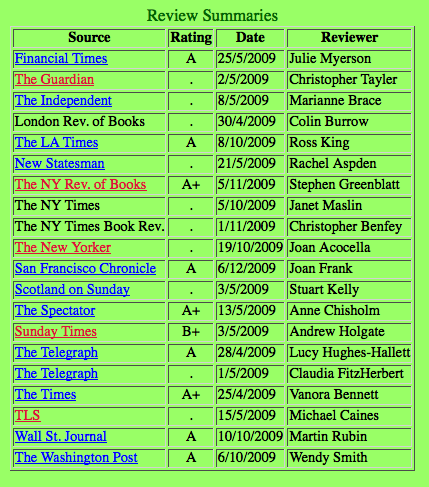 A collection of reviews of the book is here, and look at these grades! When I saw this I rushed to read the reviews without grades, hoping for an ally or two, but my hopes were soon dashed. There don't seem to be any bad reviews in here! 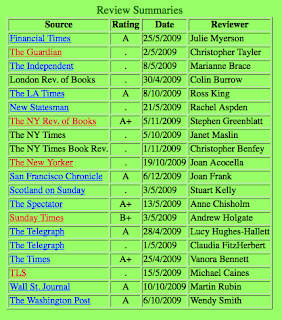 On the other hand, there are 60 1-star reviews at Amazon, and 53 2-star reviews. If you classify the 52 3-star reviews as negative, more people dislike this book than love it (there are 150 5-star reviews). And yet, all the reviewers adore this book. Could it be that I've fallen in with the wrong crowd?! To make things even worse, the things I hate about this book are either outright denied or positively acclaimed by the smart reviewers. For example, I see this book is austere to an extreme. Personally, when I go to the 16th century, I want to know what things look like, smell like, sound like. If a person goes from point A to point B, I actually want to know how they got there. By boat? Were there horses? Did it rain? We get almost none of that in this novel--it's all thinking and talking. But (nooooo, tell me that it isn't so!) some reviewers praise the book for its descriptive detail! Then there's the issue of "he", and the way it's not clear whom it refers to half the time. Gradually, after much frustration and confusion, you figure out that ambiguous and confusing instances usually refer to Thomas Cromwell. Me 'n' the other dummies at Amazon think this is just stupid and annoying, but the smart people actually think it's deliberate and brilliant! How so? The way all "he"s point to Cromwell puts him at the center of the book in some profound sense. Or: we are seeing things "through a glass darkly." Oh, ok. Now I get it! At some point he must have slept. When daylight came, the moon felt so empty it was empty even of him. The moon felt empty at daylight. It felt empty to Cromwell? In what sense did the moon feel empty? Does it sometimes feel full? And what was it doing still up at daylight anyway? And why does this 16th century man have thoughts that seem to come out of a poem in the New Yorker? Here's another puzzling paragraph, with (of course!) all the "he"s referring to Cromwell (he's thinking about Lord Chancellor Thomas More writing articles against Cardinal Wolsey). When he hears this he thinks, imagine living inside the Lord Chancellor's head. Imagine writing down such a charge and taking it to the printer, and circulating it through the court and through the realm, putting it out there to where people will believe anything:putting it out there, to the shepherds on the hills, to Tyndale's plowboy, to the beggar on the roads and the patient beast in its byre or stall; out there to the bitter winter winds, and to the weak early sun, and the snowdrops in the London gardens. If you want to imagine Thomas Cromwell having the stream of consciousness of a modern poet, there's no law against it, but why would you want to? I seriously hate not finishing a book, but life is short. Next on my list is another hugely lauded book. Uh oh. I have a lot less patience with books that don't seem to be teaching me anything as I get older. As you say, life is short and there's no final exam. Haven't read Wolf Hall, but Halldor Laxness has been one of my favorite authors ever since I read an essay in the New York Review of Books (later the intro to Independent People) about Independent People. I'm always checking Amazon to see whether any more are being published. More people should love Laxness. CA, That intro is good, but full of spoilers! Independent People is one of my favorite books of all time. I also really liked The Fish Can Sing and Paradise Reclaimed. Any others you can recommend? I had trouble with World Light, but may make a second attempt. Another thing is that a book (or a movie) may be great, but what makes it great may not interest me at all. There's often a presupposition in literary criticism that everyone should be interested in all great works of literature, while in my case, only some great works of literature interest me. However, I don't argue with the experts who claim that work X, which does not interest me, is great. Thanks very much for the link--that's terrific! Just had a look at the top 10 lists--I was surprised to discover all the affection for The Fish Can Sing. Great book!